average guy gets a job as a state trooper, gets married, has an average life. not. turns out wife has affair and kids are not his, but he shuts out the obvious and lives in denial. wife eventually runs away. end of story. not. he goes mental. when his normal mind cant take it anymore, his alter ego takes over. and there the fun begins. farrelly style. somewhere down the line, irene pops up, with killer cops after her, and she is stuck with the charlie/hank combo in a wacky escapade. 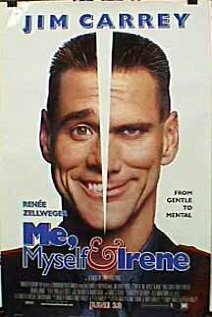 jim carrey switches between normal and mental like no one else can. irene is just the excuse to flesh out the storyline. besides, it's all good farrelly fun. jim is awesome normal, and stupendous mental. the first time hank comes out, it blew my mind. funny and tragic at the same time. you really feel for the poor sucker.